CoinGecko is pleased to announce that we have integrated with KyberWidget to allow users to swap selected ERC-20 tokens seamlessly and easily within our website. We at CoinGecko firmly believe in a decentralized future in which financial markets are open and decentralized exchanges play a more prominent role. Therefore, we are happy to work with Kyber Network to integrate KyberWidget into our website. Kyber is one of the pioneer decentralized exchanges on the market providing on-chain liquidity. Kyber aims to make instant token swaps accessible, connecting the fragmented tokenized world by enabling instant and seamless transactions among platforms, ecosystems and other use cases. Integrating KyberWidget was a very simple and easy process. It can be integrated in less than an hour and is flexible enough to allow customization on our end. With KyberWidget, it is now easy to conduct decentralized token swaps. You can easily exchange your favourite ERC-20 tokens on CoinGecko without having to create an account on an exchange. Making transactions seamless and secure without compromising the user experience is a key proposition of this integration. As soon as the token pair and the amount to exchange are indicated, a user simply unlocks his or her wallet using Metamask to approve the transaction. With the widget, users can confidently exchange as transactions are executed, or will be reverted should the indicated rate become invalid due to changes in market conditions. The selected ERC-20 tokens on CoinGecko that are now available for KyberWidget swaps are KNC, DAI, OMG, SNT, ELF, POWR, MANA, REQ, RDN, APPC, ENG, SALT, ETHOS, ADX, AST, RCN, ZIL, PAL, LEND, TOMO, and ZRX. Kyber x CoinGecko Swag Giveaway! To celebrate our collaboration with Kyber, we are hosting a giveaway of some CoinGecko and Kyber swag on Steemit! To enter a chance to win one of 25 sets CoinGecko & Kyber swag, tell us what you think about the KyberWidget on CoinGecko by making a Steemit post. Bonus upvotes will be given to anyone who will be trying out the KyberWidget on CoinGecko! We highly appreciate your feedback and would love to hear about your experience. Post your review/guide on the any Steem platform and we’ll definitely take a look at it. 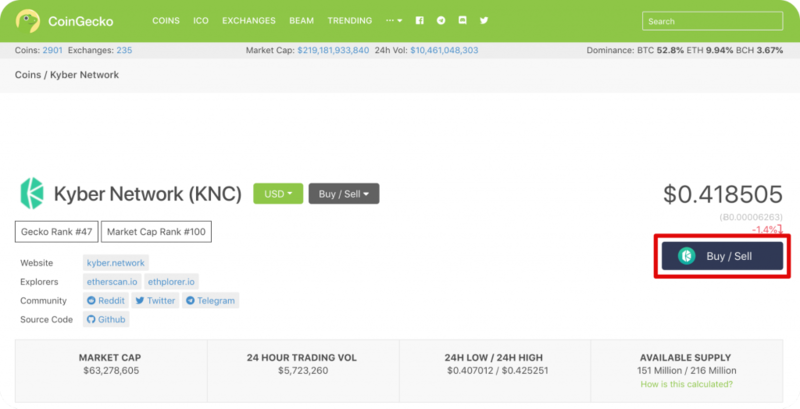 CoinGecko aims to provide a fundamental analysis of the crypto market. In addition to tracking price, volume and market capitalization, CoinGecko tracks community growth, open-source code development, major events and on-chain metrics. CoinGecko’s objective is to elevate crypto participants’ understanding of fundamental factors that drive the market. CoinGecko is one of the largest and earliest crypto data aggregators, operating since early 2014. It currently tracks nearly 3,000 tokens from more than 230 cryptocurrency exchanges. For more information, visit https://www.coingecko.com. Kyber’s on-chain liquidity protocol allows decentralized token swaps to be integrated into any application, enabling the seamless performance of value exchange among all parties in the ecosystem. Using this protocol, developers can build innovative payment flows and applications, including instant token swap services, ERC-20 payments, and financial DApps – helping to build a world which any token is usable anywhere. It is most Important to Integrate any token the same as Fiat money is able to be spent in all countries, once they have been swapped. For example: British £ can easily be changed to American $ when visiting this country. This will be a great strength of GoinGecko and Kyber because they will/are in a position to change/ accept most of the worlds money as customers require this service and might I say, very cheaply. Eventually this vital service will grow both in various coins selection as the world becomes more aware. This can all be done smoothly without leaving their own country. Amazing , we all benefit.